Another year, been and gone. While I know that New Year is just another day in the grand scheme of things, and nothing will change overnight, I do think the end of the year is a good time to take stock of what's been happening, and think about what I'd like to achieve in the future. Overall, I'd say 2015 has been a pretty good year. Back when I was in school, every year felt more or less the same, but as I get older I've had the chances to do more exciting things, making the last few years more memorable than those that came before. My year wasn't perfect of course - I doubt any ever are - but there are plenty more good things to remember than bad. The first half of the year was spent finishing up my degree - I can no longer call myself a student these days! I was thrilled though that four years of work turned into a 2:1 MA French & English Literature degree from Edinburgh University, one of the best in the country. Those last few months were by no means easy, with piles of coursework and exams, but I managed to squeeze some fun in. I kicked off the year at the Edinburgh Hogmanay street party, and saw several other great concerts over the following months. I also turned 21 back in March, the milestone age of adulthood - though I'm basically still a child, just pretending I know what I'm doing! There was plenty of celebrating for that birthday though, with the highlight being a weekend away to Copenhagen with my flatmate, who is a mere 10 days older than me. Over the summer, travel featured again, as I had saved up to take a month long trip through Central America, a definite highlight of my year! I've only been out of Europe once before, and never alone, so this was a big adventure, but I absolutely loved it. I had some great people in my tour group, and got to see some amazing, beautiful sights, from idyllic beaches to tropical wildlife to ancient ruins. While last year's European trip was fun, I think this one topped it! The rest of the summer was quite a mixed bag, and certainly an eventful month or two. I returned to summer school for the third year, this time with a promotion to management level - though that came with a pile more stress! Another of my cousins got married, so we all got a nice day out, dressed up and partying to celebrate that. Although I have no desire for a wedding of my own, I've realised going to other people's can be quite fun! However, shortly after my return from Central America, my grandfather was diagnosed with leukaemia and he passed away just a month later. This is the first close family member I've lost (I was too young to remember my other grandfather's passing), and the first funeral I've ever attended. This was a painful time for us, and it wasn't something I felt I wanted to write about at the time, but it was obviously a hugely significant moment in my year, and something I'm still coming to terms with now. Yet just a few short weeks after that, I found myself boarding a plane and moving to Hong Kong! Back at the start of the year, I said I didn't know where I was going to be in a year's time, and I probably could never have predicted that one! I started applying for jobs teaching abroad before graduation, but my plans only really fell into place at the last minute. Which made those weeks easily the most emotional ones of my life, having to deal with stress, and then grief, and then not being over that yet, when I ended up doing the most terrifying thing I've ever done in moving halfway around the world. It was also one of my best decisions though, as I'm thoroughly enjoying living in Hong Kong. My job has its ups and downs, but I really enjoy working with young children, who are always a lot of fun. I've got to see so many amazing sights around Hong Kong - from temples, to skyscrapers, to hikes, to islands, to beaches! See the links below for more! - and this will serve as a doorway for more travel, as I'll have holidays in 2016 I intend to use to see more of Asia. Looking back on the goals I set at the start of the year, it's been a somewhat mixed bag. I'm very pleased that I've kept up with my blog schedule, but I've fallen short in other forms of writing - I even had to leave my MuggleNet position, as having a full time job has used up so much of my free time and I wasn't prioritising my duties for the site. I've started reading a little more in my spare time, but I still end up watching TV in my evenings, when I just want to unwind. I've done a lot of hiking since moving to Hong Kong, but my overall fitness and eating habits aren't fantastic, though they aren't terrible either. Travelling more has been an obvious success this year, and it has also been a means of trying new things and taking opportunities. I think graduating and moving to Hong Kong was a huge achievement for me, in terms of being brave and independent, as I was utterly terrified by the prospect, yet did it anyway. It's also made me stronger, since I was dealing with so many emotions at the time. Overall, I'm continuing to grow up and figure out how the world works - though of course, there's still so much I have to learn! I'm not a fully-functioning adult yet! I still don't have any long term plans yet, but I'm hoping to work abroad and travel for a few more years. For now anyway, my blog's name is still highly appropriate, as I continue to just muddle through life. 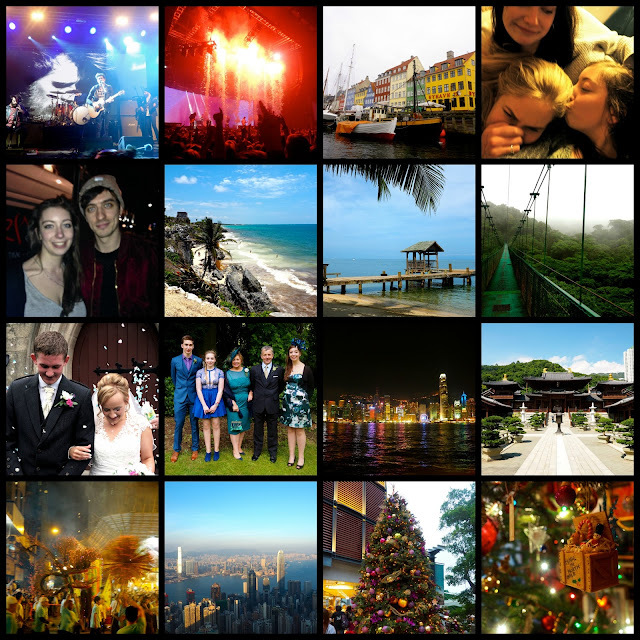 The images in the collage are a summary of the highlights of my year, and many of these events have blog posts to go alongside them. These are listed below, for anyone interested, with the numbers following the images from left to right, top to bottom.